The site of Lambourn Church is extremely ancient, for the original churchyard was circular, indicating post-Roman Celtic or possibly even pagan Roman or Iron Age beginnings. The outline is still revealed in the surrounding street pattern. The dedication to St. Michael, the destroyer of the Devil (and therefore all paganism), would certainly indicate that early Christians took over an older temple. However, suggestions that this Celtic religious enclosure or 'llan' gave its name to Lambourn seem to be unfounded. The Saxon church is believed to have dated from the reign of King Alfred who mentions Lambourn in his will. 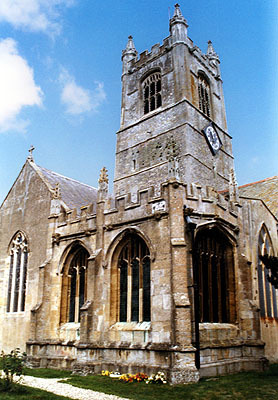 By 1032, it had become the local Minster, serving many villages in the area and the building is still officially known as the Minster Church of St. Michael in Lambourn. The present very large and historic parish church is mostly a Norman cruciform building dating from about 1180. This is best appreciated by examining the fine Norman carving on the capitals of the tower arches and the piscina in the North aisle. The transepts were rebuilt in the 13th century and the chancel and upper stages of the tower replaced in the early 16th. The door out to the destroyed rood loft can easily be seen inside and now has a balcony for access to the ringing chamber. The loft supported an altar as well as the rood and its piscina still exists high up on the wall. There are a number of chantry chapels which appear to have been first built in the 14th century, but were later rebuilt by subsequent patrons. The South or Lady Chapel has an interesting arch with rustic carvings of bishops, horn players and hounds chasing a hare. It was founded, and subsequently much favoured by, the Estbury family, lords of the manor of Eastbury. The brass to the founder himself, John Estbury and his son (1372) can still be seen but others have long disappeared. Another survivor is, controversially, said to be for a second John Estbury and his wife, Agnes, dated 1438. The chapel was restored by a third John Estbury who also founded the Estbury or Extreme South or Holy Trinity Chapel in 1502. He died in 1508 and was buried in the latter under a fine tomb chest with brass effigy and side shields. Some of the original 16th century German glass from here can now be seen in the North Chapel. This was replaced when the Estbury chapel taken over by the Hippisley family of Lambourn Place and there heraldry considerably brightens up the windows (dated 1855). A carving of King Charles 'the Martyr', taken from their demolished home, is on a wall outside the Lady Chapel. The North or Essex or St. Katherine's Chapel, which dated from the late 16th century, was for many years, during the Georgian Era, used as the local fire station, having housed an early fire-engine! Being in a serious state of decay, it was entirely rebuilt in 1849. Luckily its fittings were retained, including a communion table of 1633, the old font purchased for £6 in 1666 and the superb effigial monument to Sir Thomas and Lady Essex. Sir Thomas, lord of the manor of Chipping Lambourn (alias Lambourn Plucknet), was a local high-flyer, having married the daughter of Lord Sandys of the Vyne (Sherborne St. John, Hampshire). The heraldry on this fitting monument shows off his family connections; while his head rests on a firey salamander of Essex and his feet on a dolphin. The local stocks were also once kept in this chapel. The other notable monuments in the church are to the widespread Garrard family from Kingwood in Lambourn Woodlands and elsewhere. There are three brasses, one in the chancel with figures of Thomas Garrard and his wife (1619) in elegant Jacobean dress. Nearby are contemporary chairs dated 1636. Thomas does not reappear on the renaissance style memorial to his kneeling father (1583) on the north side of the high-altar, but his half-brother and sister are there. His great grandson, Charles, has a rather elegant cherub adorned tablet (1710) in the Lady Chapel which has been recently restored. The latest memorial to a member of this family is dated 1913!